Lionel John T Burgoyne b. 1877 Edmonton, d. 1881 Hackney when he was living with his mother's parents in Hackney. James Henry Burgoyne b. 1880 Lucknow, marr. 1902 Eva Violet Cotterell by whom he had five children. Edith Elizabeth Burgoyne b. 1881 Allahabad (re. in Army Births and Baptisms), d. 1945 in an air raid, possibly from a V1 bomb. In 1901 she was a housemaid. In 1918 she went to work for the Curry family in Canada. The father was a director of the Canadian Pacific Railway. She married three times and had three children. Elizabeth Frances Burgoyne b. 1883 Hackney, 1901 laundry ironer, marr. 1905 in Hackney Frederick Walter Mawbey photographer, d. 1970. She had two children. Theresa Florence Burgoyne b. 1885, 1901 laundry ironer, marr. 1909 in Hackney Joseph Curd, d. 1972. They had two children. Violet Mary Burgoyne b. 1887 Hackney, marr. 1913 in Hackney George Sharman, d. 1970 Redbridge. They had four children. Ethel Burgoyne b. 1889 Clapton, d. ?? as a result of flying bomb in London. 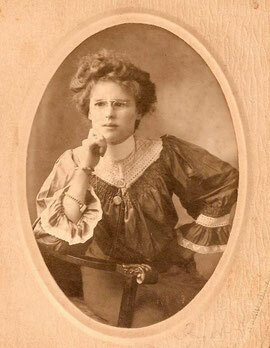 In 1911 she was a packer and sorter living with her mother.